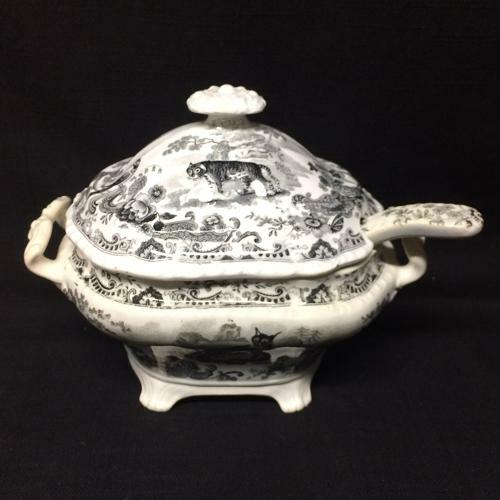 This is spectacular black Staffordshire transferware serving tureen, c. 1820. It measures 7 1/2 “ long and 5 ” across x 5 1/2 “ tall. It was impeccably potted and finely transfer printed in a rich and intense bittersweet black, with a pearlware glaze, gadrooned edge and scalloped rim. The base and cover each have bold borders with 4 birds along with lavish flowers and a butterfly. The cover has a Leopard Cat, the base has two Foxes and the Ladle has two Sheep at rest.